Here’s the full official iOS 10.2 release notes / changelog showing changes and each and every new feature that is new in Apple’s latest firmware release for iPhone, iPad and iPod touch devices. Apple has officially released iOS 10.2 to the global public, for the download and consumption on compatible iPhone, iPad and iPod touch hardware. Accompanying that release is the full official changelog that details everything that is new in the release. As is generally the case with Apple, iOS 10.2 has been in the hands of developers and public beta testers for quite some time though. This testing period has resulted in Apple issuing seven pre-release seeds to those testers, with the aim of gathering feedback and bug reports on the platform in order to finalize and streamline it for this eventual public launch. History has already shown us that this level of dedication to progressing a platform, which ultimately involves invoking the expertise and keen eyes of those who will be using the platform, results in a higher quality product being achieved. As you will probably be aware by now, iOS 10.2 is thankfully more than just a point update that looks to streamline the platform and enhance the overall user-experience. 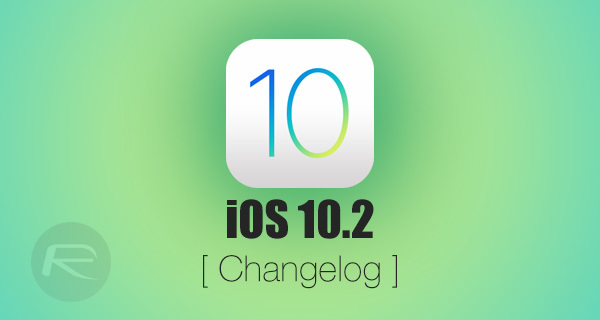 In fact, given the amount of changes and inclusions, it actually feels like a larger release than iOS 10.1 which made its way into the hands of device owners during the last week of October 2016. Not only is iOS 10.2 packed full of slight changes, amendments, and improvements, but it actually also contains a number of entirely new additions, such as the integration of the TV app which Apple waxed lyrical about during the recent “hello again” Mac event. The new TV app has ultimately replaced the Videos app within iOS 10.2, coming with an array of functionality and even its own dedicated Home and Lock screen interactive widget. Apple has also made some changes to the native Messages app in iOS 10.2, introducing a number of new full-screen messaging effects, all of which can be used to send communications to other users running iOS 10.2 on a compatible iPhone, iPad or iPod touch. Those changes are also accompanied by many new emojis, changes to how data is taken via the Health app, and how device owners can make emergency calls in India, among other things. The full changelog, or release notes if you prefer that terminology, can be found below, running you through exactly what’s new with iOS 10.2 in Apple’s eyes. For those that have a compatible iPhone or iPad, the iOS 10.2 update is available to download as an over-the-air update right now. Why would anyone stay back on iOS 9? I guess I missed that important part of his comment.